1987 saw me running a little faster than time. That year my sister and I threw a 50th wedding anniversary party for our parents, across country in Massachusetts. It wasn’t until the invitations went out that an aunt noted that this was only year #49. Oh well, the plans were in motion, so we forged ahead with the 3-day Memorial weekend festivities, wedged between the NAME Hawaii cruise and the Guild School (at that time held in July). In the interstices we built Pine Lake Park, the middle of three 1987 teaching projects, along with time spent on the Greene & Greene, the big project-in-the-works. Noel worked the original design around so it would fit on our standard 13” X 18” base (to fit the shipping boxes). 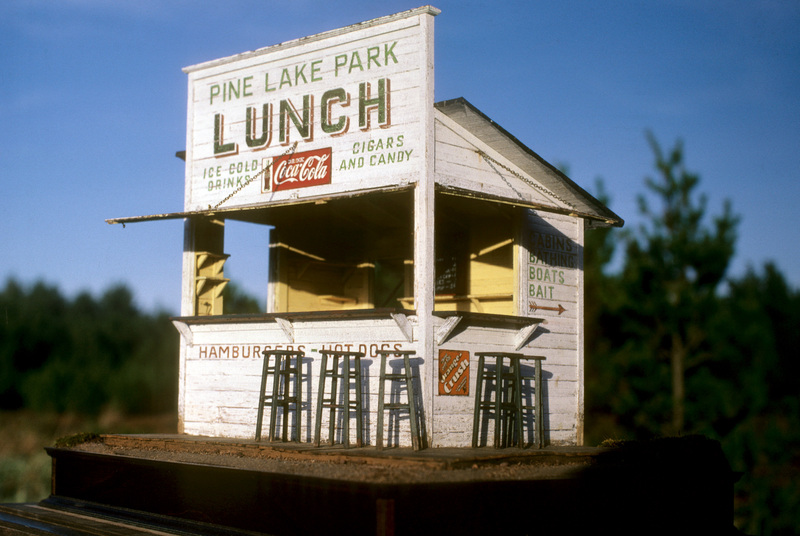 I remember him having fun with the signage—recreating period Coca Cola and Orange Crush signs, plus adding directional signs to Restrooms, Bait, and Boats. Time-consuming as they were, these were the kinds of details that kept us excited about the work. For us, these vernacular structures were great trips through the imagination–how to create the feeling of summers past, when time went on forever and skies were always blue. 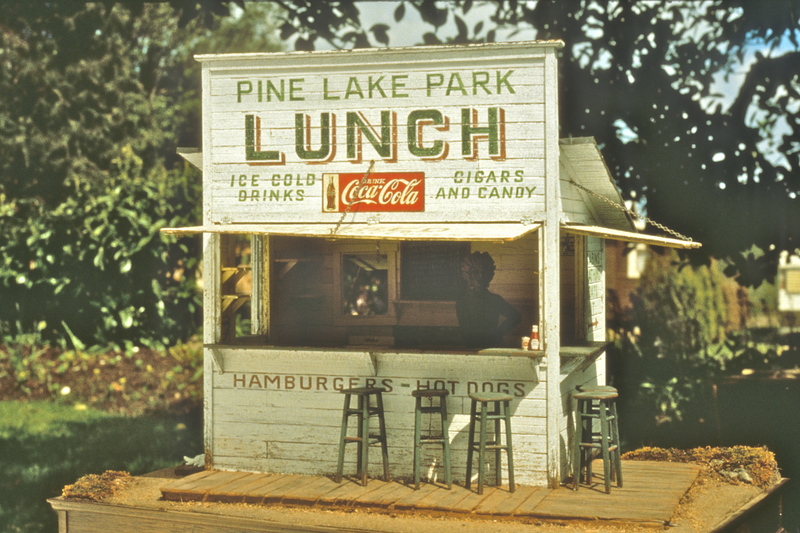 Our conjured luncheonette under the fragrant pines included hot sand, hot feet, hot dogs dripping mustard down our arms. 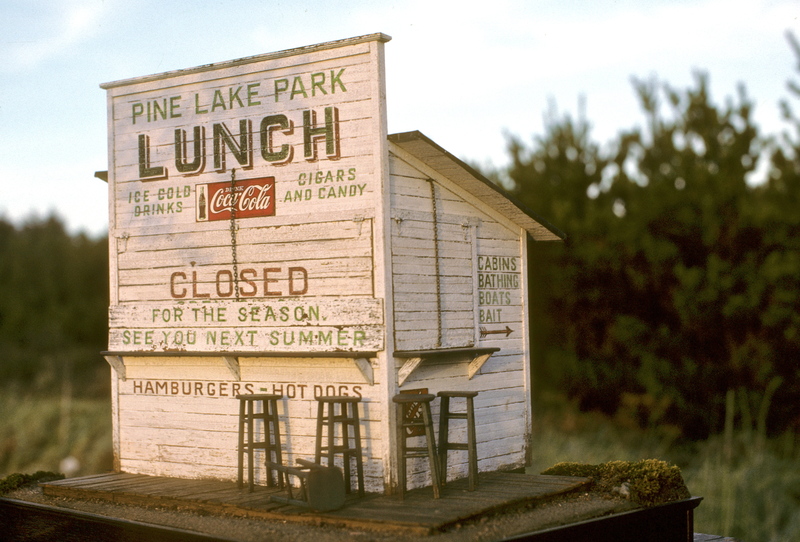 Roadside architecture was a great way to teach weathering techniques. Most were seasonal buildings, closed up for the winter and left to the elements, which accelerated the effects of weather. They warped and tilted. Rather than being repaired on an annual basis, they might have been touched up with a little paint, the leak over the grill plugged with a spatula-full of Quick-Patch. One of the challenges was how to create the look of cracked, peeling paint–coats of paint layered over another. 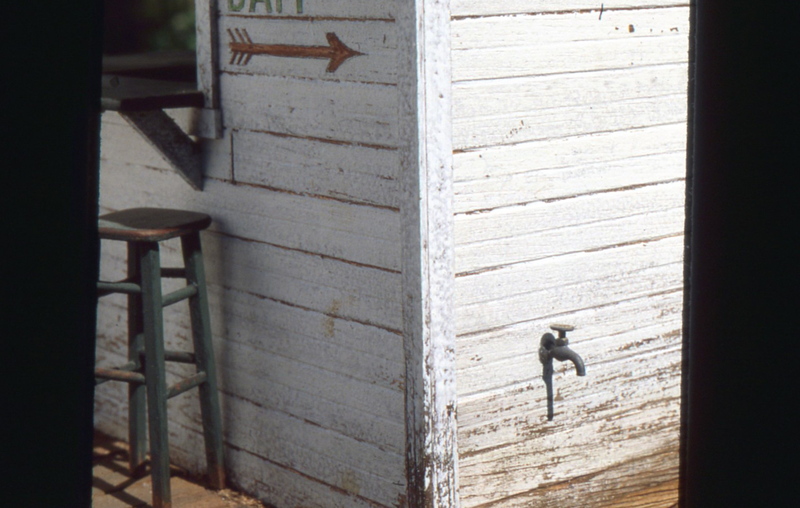 For this series of projects we experimented with rubber cement, painting it on the bare exterior walls, taking some off, and re-painting, sometimes with colors that didn’t quite match. Or maybe it was white now, but used to be green. Plus, the students got to paint their own signs (in those golden days when everyone stayed up until 3:00 a.m. working on their projects). Noel laid the lettering out on paper, they traced the design onto the wood, then practiced that childhood skill of painting between the lines. It was all right if they weren’t perfect—these were imperfect structures, the finishes thrived on interpretation and personal quirks. The real challenge in class was to get far enough long to hinge the front and side flaps, and show off the winter signage on graduation night. 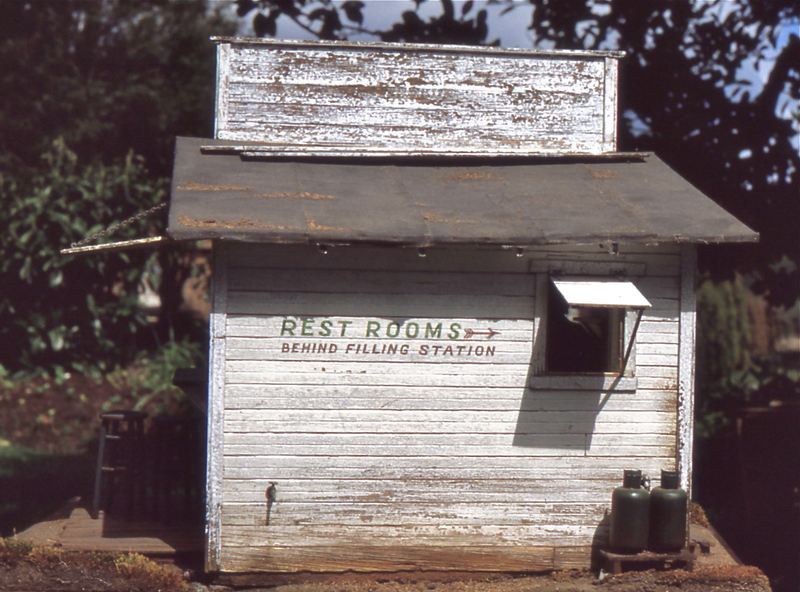 The wavery black tar rolled roofing was made from emery cloth, cut in strips, glued with Elmer’s white, and overlapped. This messy process usually added sufficient wear and tear. I believe we made “pine needles” for the roof from dried plant matter we ground up and sprinkled over glue, under the imaginary namesake pine tree that must have shaded the back of the building. Over all, we applied a thin, dirty water wash (lots of water, 2 dabs of Mars Black, 1 dab Raw Umber tube acrylics, well stirred) to add the final weathered look. The stools were not included—no time in class–but the plans were, for those who chose to make their own (they took me weeks, I did not recommend the process). Also, as always, our students were left to their own devising on the interiors–we wanted everyone to add their own touches. Noel’s deep fryers, fridges, and grills were never mass produced, though he did make a few on commission. As it was, just to get the basics done by the end of the week we raced through each day of demos, work, procedural hiccups and project pieces checked off. But we were young then, we knew the magic of how to fly, how to inflate time to fit the space. 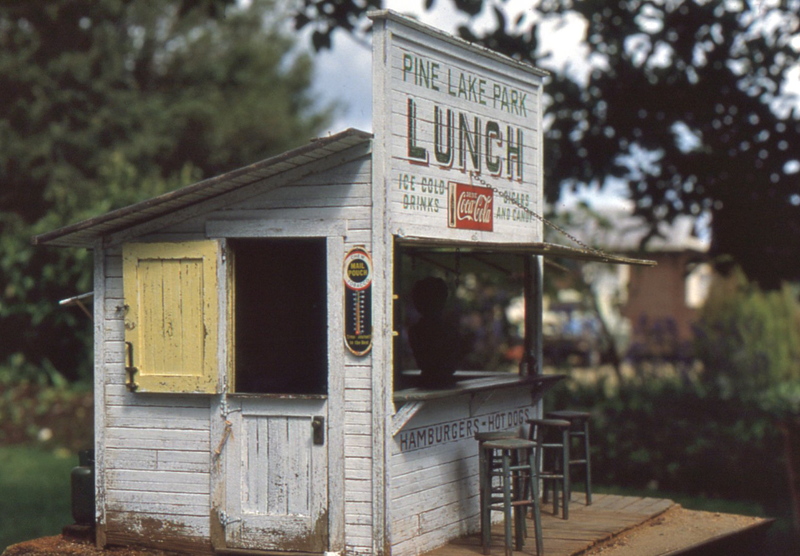 This entry was posted in Houses, Miniatures, Teaching and tagged architecture, dollhouses, miniatures, Roadside architecture, work style. Bookmark the permalink. wow, i wish i could have taken the class. the work you both did on the peeling paint and the signage alone is perfect! makes me nostalgic. It was crazy fun–glad you like it. Gee, I didn’t remember Castine being in July, but I was young then too and probably out flying! Inflating time to fit space seems to be a lost art, I only seem to be able to shrink it these days… perhaps I missed the dry clean only label. Oops, the memory fails. But it was late June then, wasn’t it? There’s no way I held a big party in MA on Memorial day weekend, then taught a week later in ME. There was time between to get home and back. You were there, I know! Thanks, Linda–always good to hear from you.